Today's prop played a special role in the wedding. 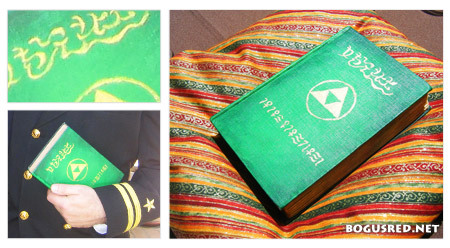 The Book of Mudora was used by Link in Legend of Zelda: A Link to the Past to translate Hylian text and allow him to enter the Desert Palace. Our officiant used the Book of Mudora to hold the reading material for the ceremony. It also doubled as a centerpiece. I created it by finding an old book and painting the outside cover with acrylic paints. A special note about our officiant; my brother who is an officer in the US Navy officiated the ceremony. I thought it was weird to hire a stranger to handle the most special part of the wedding day so having a family member help with this made it more special. You can also blame my brother for my love of Zelda games. He traded my beloved Turtles in Time game for A Link to the Past (without my permission! ), but it was worth it. This blog is actually powered by PaperDemon.com blogs. You'll need to head on over to this blog page and be logged into PaperDemon to post a comment.